It seems the guys at Climate Camp Cymru have been at work again, this time at the Western Wood Biomass plant in Port Talbot. 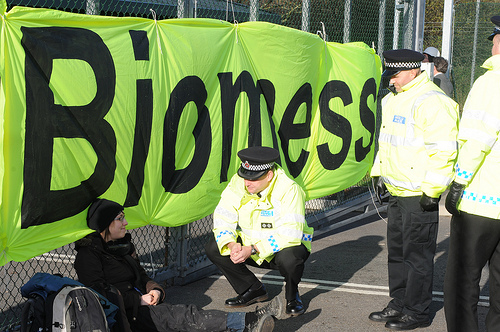 Three people were arrested after climate change activists used bicycle locks to chain themselves to the gates of the wood burning plant to prevent the hourly 20 tonne wood chip delivery that is required to keep it in operation. 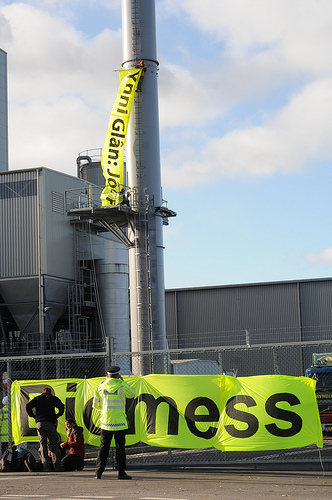 Others scaled the chimney revealing a banner saying ‘Clean Energy:Dirty Joke’ in Welsh. Biomass could be a viable answer to contribute to a more sustainable way of producing energy, but only if the wood for burning is sustainably sourced or recycled from horticultural waste.The plant at Port Talbot is a smaller ‘pilot’ plant which if deemed successful will pave the way for two larger sites to be developed in Wales. One will be a £400 million plant close by which will burn wood that can provide power for up to 500,000 homes, with construction set to start next year. Another proposed is in Holyhead where Anglesey aluminium wants a facility to burn wood for the smelting process. At the moment all wood sourced for the Port Talbot plant comes from sources in the UK, but campaigners believe that with the introduction of larger plants, timber would have to be imported from overseas where it would be harder to guarantee it has come from a sustainable source. Undercurrents Alternative News produced this package on the latest protest. It seems like somewhat of a paradox that biomass energy has been feted as a renewable energy source. As with biofuels, it is only truly renewable if the combustible material is waste from other uses. Smaller scale community based biomass projects harvesting vegetation waste like the BedZED development in South London have even had their problems. Questions must then be raised on the ethics behind scaling up such a process for mass energy production. For the companies involved it will obviously have to be an industrially lucrative venture, but at what expense? Seemingly the bigger the beast, the bigger the feast. So it seems the people in the valleys of the Cynon, Rhondda, Afan and Neath valleys are Y.I.M.B.Y’s? The not in my back yarders must be a little miffed as it seems this time they are in the minority, after an independent survey has revealed that only 1 in 10 people were against wind farms being developed. The survey was carried out by BMG Research on behalf of Nuon Renewables who are planning to construct wind turbines near Pen-y-Cymoedd. All the stats can be found in the Western Mail’s online article from last week but the most interesting is that 73% of people are in favour of more wind energy but with 63% percent fully backing wind farms. What does this mean exactly? Whats the difference? A bit dubious that one. It’s all certainly at odds with last months news in the South Wales Argus that residents were not consulted about Tesco’s plans to erect two turbines at their store in Newport. Check out the comments on the article, it certainly ruffled a few feathers. Regardless of that case, could the acceptance of the more isolated valley communities mean that public feeling towards wind turbines is changing, or are people just indifferent? What could be the reason behind it? Maybe its internet based campaigns which have cast this renewable energy source in a more favourable light? Plus if big companies and brands are beginning to back the use of wind and appear sustainable, then psychologically people may think, ‘Well if its good enough for them then its good enough for us’. Some of my colleagues studying the Postgraduate Diploma in Magazine Journalism ventured north to gauge public opinion in Aberdare for themselves. I think it would be much easier for people to stomach if the wind farms became community projects or co-operatives. When fuel prices start to rocket perhaps more wind farm co-operative projects like the West Mill Farm in Oxfordshire formed in 2006 or the Baywind project in Cumbria which goes back to 1996, will become more commonplace. It certainly is important to dispel some of the myths that surround wind turbines, with regard to noise and also the public fearing the safety of birds – why would the RSPB back wind farms if that were the case? I could not comment on the noise as I am yet to get up close and personal with a wind turbine, although it is definitely on my list of things to do (that makes me sound a little bit like a train spotter!). Its all about personal opinion, and the press seem to be filling many column inches with arguments for and against our move as a nation to utilises the renewable power of the wind. The Environment Minister has said people in Wales must make a fundamental lifestyle change to tackle climate problems. Jane Davidson says Wales is not doing enough towards sustainability. Evidence from scientists and economists shows taking action now will cost us less than taking action in the future. Talking at the recent Welsh Green Heroes event, the Assembly Mininster told me that everyone needs to think about their way of life to ensure they are as energy efficient as possible. An exhibition showcasing Wales’ green heroes is currently travelling across the country. The Welsh Green List celebrates people who are working towards sustainability across the country. It’s the first of its kind, and organisers hope it will inspire others to take action against climate change. There are 52 green heroes on the list – one for each week of the year. And all of them have been judged as a ‘champion’ who deserves recognition for tackling sustainability and climate change. The idea is to celebrate the work of environmentally-minded people in communities across Wales, and then to inspire and motivate others to follow their example. The list profiles all sorts of people, including school children, business people, community workers, teachers and musicians. There are also some well-known names, including the Environment Minister Jane Davidson and Gillian Clarke, the National Poet of Wales. At the launch event I spoke to organiser Helen Nelson, executive director of Cynnal Cymru Sustain Wales, to find out more about this unique award. The list comes from a nationwide hunt, which started back in the early summer. People across Wales were asked to think of green champions in their own communities and nominate them to feature in the Green List. The nominations were then short-listed by a panel of representatives from the business, media, voluntary and sustainable development sectors. The judging criteria centres on sustainability and people who are ‘building a healthy, happy and fair society’. So the chosen green heroes are not just stereotypical environmentalists. They are ordinary people, from any background, making a difference to their communities. Judges told me the idea is to show that green issues aren’t just something you read about in the paper or watch on TV. They’re about real people, real lives and making Wales a better place. To help promote the list, Cynnal Cymru has launched a new film and photographic exhibition profiling some of the green champions. It shows what different people are doing in their quest for sustainability. The exhibition will tour across Wales over the next six months. It has now opened at Bridgend. 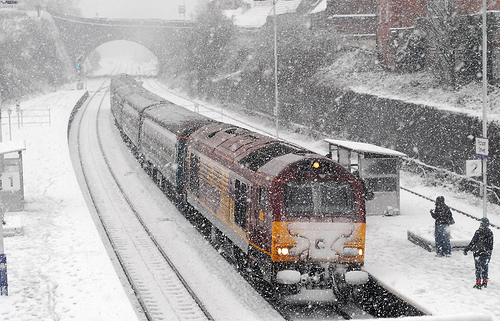 It will then move on to Neath Port Talbot and Rhondda in December and January. The people on this list are quite extraordinary. Some have dedicated their whole existence to sustainable living. And, without doubt, the idea behind the list is well considered. 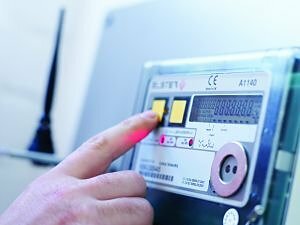 But there continues to be a denial among many people across Wales as to the need to change our lives to be more sustainable. I hope the exhibition will prove very popular and a great success in inspiring people to ‘do their bit’ for the environment. But the cynic in me worries that even if people visit the exhibition, their admiration and good intentions will quickly turn down the normal road to denial and a reluctance to give up the luxuries and simplicity of their current lives to save the world. To find out more information on the exhibition and to read profiles of the Welsh Green heroes, visit the Cynnal Cymru Sustain Wales website.